It takes a while to sketch out for others what is ofter already in my head. This is a picture with more specific dimensions of "Pillumn" I will be getting my materials this week to start fabricating the piece. I can't wait to get my hands dirty! The last couple of days (off and on), I have spent working through the logistics and paperwork involved for the exhibit I am a part of on Bondi Beach in a couple of short months. Below are some thoughts I sent off to the Education manager of the show. I will be talking to some school kids about my work and and answer questions etc. At their request, I also sent a bunch of process/working images of me making art. In my art I use many different processes. If I am making something for myself without a place in mind for it to go, first I go out hunting for my materials. I used salvaged industrial steel that I repurpose into sculptures. I usually think of the pieces I choose and put together to make sculpture as a puzzle to be solved. I like to make the form interact in ways that make you question how they are standing. I play with the tension between the heavy steel and gravity. I try to make the steel appear light. When I am working on piece for a specific purpose, I will start at the drawing board and sketch out ideas. I like to know where something is going before I design a sculpture so that it reflects the environment in the right way. After I sketch it, I will create a maquette and this becomes a more solid model for the bigger piece that I will build. and always remember measure twice cut once! To make the sculptures, I weld, cut, paint, grind, smooth, prime, spray, clean, move, package, hang, bolt down, drill, plan, sketch, deliver, wire brush etc. 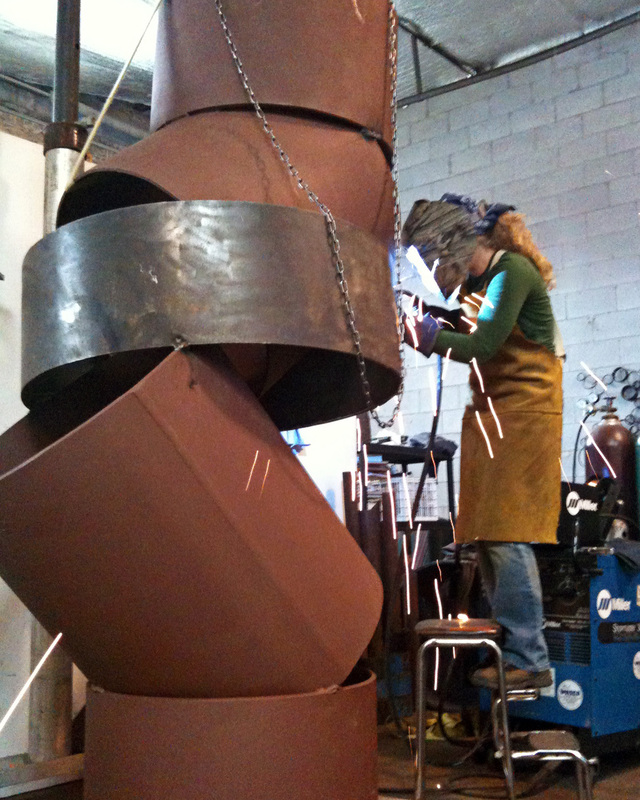 I make my sculptures out of salvaged industrial steel. I want to expand my materials and work more with stone and wood in the future. I never am "off work." Many people leave work and 5pm and don't think about it until the next morning. I am constantly seeing and reacting to things that affect me and work their way into my aesthetic. I do not mean this as a bad thing that I am never off of work, because I love what I do, so it isn't really like work to me. Thanks is the trade off of being an artist – you get to wake up each day inspired and full of passion for your life's work. Whew! It has been a long while since I made time for this little blog. Whoops! So here is the first update of what happened in the last few months...a lot of cool stuff! I am excited to be in this year's Lakefront Sculpture Exhibit. My sculpture is named Five. In keeping with my series of pillars or columns, Five is another tribute to my family. I am fortunate to have four siblings and this sculpture has one ring for each of us. We may look like we are going to topple over, but welded together, we make a balanced unit. Alderman Tom Tunney was kind enough to sponsor my sculpture in the garden that he donated to the city, Ann Sather Garden (Irving Park and Seminary in the 44th Ward of Chicago). It is a beautiful public space that has lovely plantings and plenty of room for you to go and enjoy the outdoors and my sculpture. Below is a story in pictures of the process of making Five. Once again my handy gantry helps to make another large scale sculpture. I'd say the hardest part of building this piece was getting the right angles in place to make it sturdy enough to stand but also still appear lighter that the .5" steel wall. Sincere thanks to the guys at Commercial Pallet for their help lifting Five onto the trailer. The opening at Sedgewick Studios was a huge success! Every artist was present and there was a great turnout. Everyone had a lovely evening and I met some nice new people that went out of their way to talk to me and tell me about how they liked my work (we had to wear name tags with a picture of our sculpture on them to identify us as artists). It is always a nice complement when children talk to me about my art... I can trust them more, ya know? All in all I am thrilled to be a part of this wonderful exhibit and very thankful to everyone who helped make it possible. Please frequent the businesses that sponsor this event! Below are some photos of this year's brochure.